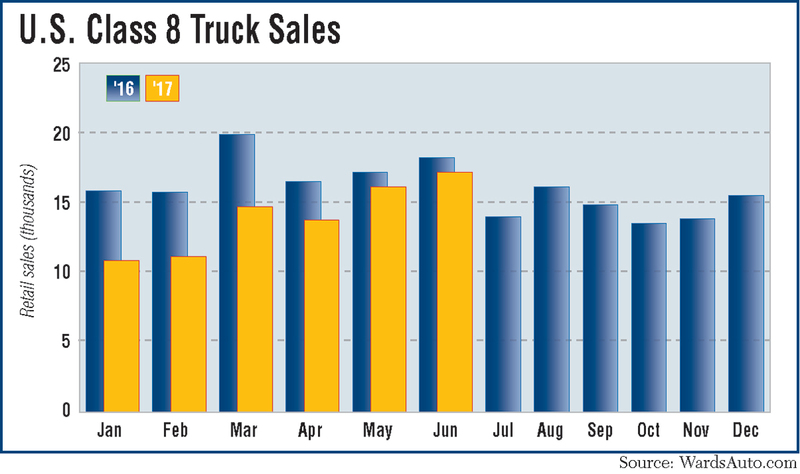 U.S. retail sales of Class 8 trucks in June climbed to an 11-month high amid a moderately improving economy, experts said, but at just over 17,000 were down nearly 6% year-over-year; and through the first six months of the year, sales were off 19%. Sales reached 17,310, down 5.7% compared with 18,354, a year earlier, WardsAuto.com reported. Year-to-date volumes hit 84,331, compared with 104,158 in the 2016 period. One analyst, however, suggested 2017 ultimately may produce stronger sales than 2016. “Last year, [with sales] we started high and ended low. This year, we started low and expect to end high. Starting soon, and maybe in July, year-over-year sales are going to be increasing,” Don Ake, vice president of commercial vehicles at the research company FTR, told Transport Topics. “Sales have been the tail of the dog so far in market indicators,” ACT Research Co. Vice President Steve Tam said, referring to stronger gains in year-over-year orders and production. “We are to go from a 1.2% gross domestic product in the first quarter to about 3% in the second quarter then high 2’s or mid 2’s after that for the rest of the year,” Costello said in July. June sales showed both gains and losses, year-over-year, depending on the respective the truck maker. But all truck makers saw sales fall year-to-date, compared with the 2016 period, Ward’s said. Freightliner remained the market leader for June and the first half of 2017. In June, Freightliner’s sales fell 6.1% to 6,313, good for a 36.5% market share, compared with a year earlier. Also, Freightliner’s year-to-date market share slipped to 37.8%, compared with 40.4% in the 2016 period. Three truck makers posted sales gains for June: Peterbilt Motors Co., International Trucks and Western Star. Peterbilt saw a 19.2% jump to 2,781 trucks and a 16.1% market share. Year-to-date, its share increased to 15.9%, compared with 13.1% in the 2016 period. Peterbilt is a brand of Paccar Inc.
International had a 10.2% increase to 1,710 trucks, good for a 9.9% share. For the first six months, its share slipped to 10.4% from 11.2% in the 2016 period. International is the brand of Navistar international Corp.
Small and medium-size fleets are buyers and leasing companies “have a pretty strong presence” in the market now, Jeff Sass, senior vice president, North America truck sales and marketing for Navistar International Corp., told TT. One truckload carrier told TT it plans to add Class 8s powered by diesel and others by compressed natural gas, depending on the application. “We plan to source 10 new diesel trucks this year from Kenworth Truck Co. [a Paccar brand] to maintain our company fleet size. Some of our older company trucks have already moved into our lease-purchase program,” said Rich Casoli, vice president of business operations for Beemac Trucking. “Also, we also are looking to add on and replace some of our CNG trucks in 2018. That is our plan currently. All of our CNG tractors are running in extreme regional applications,” he said. “If we have a need to add a company truck that is in our regional application we would go with CNG. If it is an over-the-road application, we would go with diesel,” he said. Beemac is based in Ambridge, Pa. It uses 300 owner-operators in addition to 50 company trucks, 20 of which use compressed natural gas. Beemac considers itself a pioneer in pairing open-deck trailers with CNG tractors. Casoli said business this year is “phenomenal” and he expects growth among regional customers in 2018, too. Among other truck makers, Kenworth’s June sales year-over-year dropped 7.7% to 2,530, good for a 14.6% share. Year-to-date, its market share was flat at 14.1%, compared with the 2016 period. Kenworth is a Paccar Inc. brand, too. Mack Trucks sold 1,764 units in June, down 14.2%, and good for a 10.2% share. Year-to-date, Mack’s share rose to 9.3%, compared with 8.6% in the 2016 period. Volvo Trucks North America notched sales of 1,630, down 33.9%, earning it a 9.4% share. Year-to-date, its share fell to 9.6% from 10.1%. Niche truck maker Western Star — also a unit of DTNA — saw sales increase to 560 trucks, up 23.6% from a year earlier, and good for a 3.2% market share. Its year-to-date share was 2.8%, up from 2.5% a year earlier.